Seattle Home Inspector's Blog: Home sweet home is for the birds! Home sweet home is for the birds! Insulated covers that are designed to cover outside faucets are very common. It seems that the word about these covers has gotten out so well, that most people think that all outside faucets should have them. I find that I am just as likely to see them on faucets that are “frost-free,” as I am to find them on outside faucets that can freeze. In modern construction all outside faucets are required to be frost-free type and have an anti-siphon component as well. In this first picture we can see a cover that is poorly installed and that will not protect the faucet from freezing at all-----and this is a type that needs protecting. Installing these covers on faucets that do not need them will not likely create any real problem other than annoy the inspector that has to take them all off to test the faucets----and be a waste of money and natural resources. Some of these covers can take a couple of minutes to get off and a couple of more to get them back on. This is not a fun part of the inspection when it is 20 degrees outside. Some of them have cinch type attachments that make removal and installation very easy. While the previous picture does nothing for the faucet and possible freezing of pipes, it did make a wonderful home for some lucky birds. My favorite part of Saturday is catching up on all the great blog posts that I missed during the busy week... thanks for making my Saturday educational and fun. thanks for sharing this - I love reading your blogs and learning something each time- again - what were they thinking! That's the best use I've ever seen for those things. I just had frost-free spigots put on my house last fall. It was a pleasure not having to "turn them off" from inside, and drain them.. and not to have to turn them back on, this spring. Alan----so what did you do with your old covers? That's probably the best use for those darn things. Change all the hose bibs to frost freeze and use the covers as birds nests. At least the birdies will stay warm. Charles, I always thought that's what they were for, the birds. Suesan and Roy----seems most people don't like these things too much. Is it only inspectors? Down here in South Louisiana we don't have much use for those. One thing you didn't mention Charlie, but is important. A frost free hose bibb is NOT frost free if the hose is still attached. That frost free bibb has to be able to drain. I've seen lots of frost free bibbs with holes in the pipe due to freezing (with hose left on). Oh yeah, I really hate those foam insulators. Especially the ones with rubber bands that usually break when you try to reinstall them. Good point, Charles, and I like David's comment, too. Some people overdo, and many people don't have a clue as to how to do things right. Have an inspection before you list the property. David, for sure. When I find hoses connected in the winter, I don't put them back on. Suzanne----some day that will be the norm. I second what David said. I hate to remove these, they can be such a pain to get back in place. Charles... I never had covers. You don't have to "cover" a spigot, if there's no water in 'em. Some houses have four or five of these things----all on faucets that don't need them. 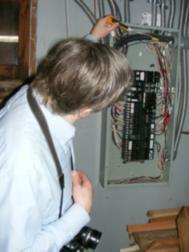 They can add a significant amount of time to the inspection. I can see why the birds would like these cozy little things. But they are a little low on the ground so perhaps it wasn't birds that built the nest? Oh come on Charlie! Haven't you ever seen "squirrel eggs"? I suspect it was Nutsy messin' with you. Bet he was around the corner teeheeing! Almost never see those things out here. Seems useless to me.